This really pretty topaz yellow Baroque 7 3/4 Inches high Flared Vase with Flame Handles was made by Fostoria Glass. This Vase measures 5 Inches in diameter across the top. It is in very good condition with no chips, cracks or scratches. Be sure to search our other Fostoria glass available. We guarantee all items to be as described. Feel free to email with any questions. THANK YOU. 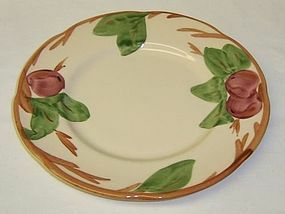 This is a really nice Apple 7 7/8 Inch Salad Plate made by Franciscan. The Plate is signed AUTHENTIC HAND DECORATED CLASSIC - FRANCISCAN - DISHWASHER and MICROWAVE SAFE - MADE IN STAFFORDSHIRE, ENGLAND. The Plate is in really good condition with no chips or cracks. The surface is shiny. Be sure to search our other Franciscan available. 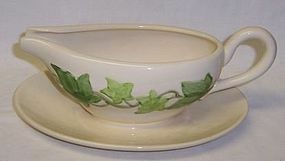 This is a really nice Ivy Sauce Boat with attached Under Plate made by Franciscan. 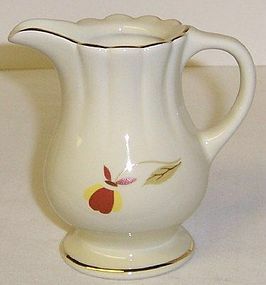 The Sauce Boat measures 9 inches from spout to handle and is signed FRANCISCAN MADE IN CALIFORNIA U.S.A. HAND DECORATED GLADDING, MCBEAN & CO. OVEN SAFE. It is in really good condition with no chips, cracks or scratches. Be sure to search our other Franciscan available. We guarantee all items to be as described. Feel free to email any questions. THANK YOU. This is a really great pink Depression Glass 7-Piece Spiral Water Pitcher Set made by Fry or Central Glass. This Water Set includes a 9 1/4 inch high Pitcher with Set On Lid and five 5 1/2 inch high Ice Tea Tumblers. The Pitcher, Lid and all five Tumblers are in very good condition with no chips or cracks. This water set can be a hard one to find. 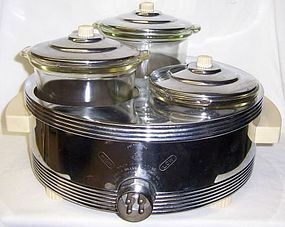 Be sure to search our other depression era glassware available. We guarantee items to be as described. THANK YOU. 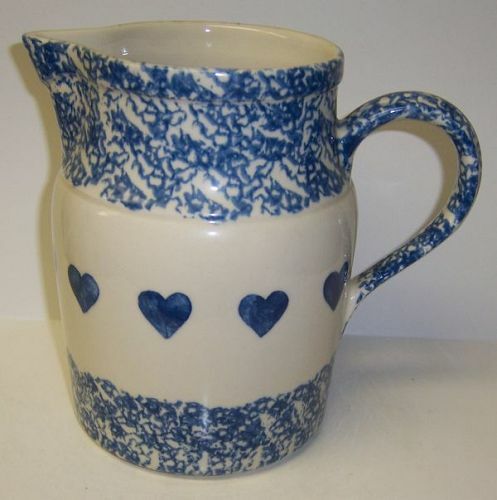 This is a really nice Blue Hearts 7 1/2 inch high 72 Ounce Water Pitcher made by The Workshops of Gerald E. Henn. This Pitcher is in very good condition with no chips or cracks. It is signed on the bottom MICROWAVE . DISHWASHER . OVEN PROOF . USA . ROSEVILLE, OHIO. We guarantee items to be as described. THANK YOU. 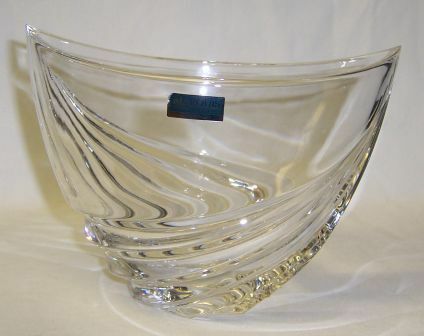 This really pretty lead crystal Marquis 8 inch Bowl was made by Waterford. This bowl measures 7 3/4 inches X 5 3/4 inches X 5 1/2 inches high. It is in very good condition with no chips or cracks. The original label is attached. 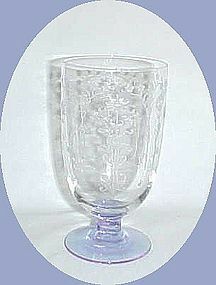 On the label is Zephyr 8 inch Bowl Lead Crystal 108519 - MARQUIS WATERFORD Crystal Made in Germany. Also, etched in the bottom of the bowl is MARQUIS by WATERFORD. We guarantee all items to be as described. THANK YOU. 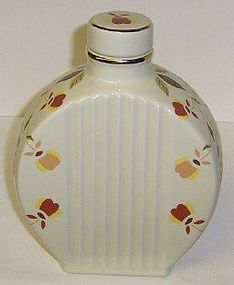 This is a really nice 2000 National Autumn Leaf Collectors Club-NALCC Autumn Leaf Jewel T Zephyr Water Bottle with Stopper. Both the bottle and stopper are in mint, unused, condition, in the original box. It is signed on the bottom MADE EXPRESSLY FOR The AUTUMN LEAF COLLECTORS CLUB by The HALL CHINA CO. 2000. Be sure to search our other Autumn Leaf items available. We guarantee all items to be as described. Feel free to email with any questions. THANK YOU. This is a really nice 1992 National Autumn Leaf Collectors Club NALCC Autumn Leaf Jewel T Baby Ball Jug Club piece. This Baby Ball Jug is in mint, unused, condition. It is signed on the bottom MADE EXPRESSLY FOR The AUTUMN LEAF CLUB by the HALL CHINA CO. 1992. Be sure to search our other Autumn Leaf pieces available. We guarantee all items to be as described. Feel free to email with any questions. THANK YOU. 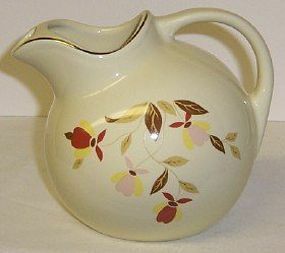 This is a really nice 1998 National Autumn Leaf Collectors Club-NALCC Autumn Leaf Jewel T 3 1/4 inch high Creamer. This Creamer was originally given as a Club Member Gift. It is in mint, unused, condition, in the original box. It is signed on the bottom N.A.L.C.C. 1998. Be sure to search our other Autumn Leaf items available. We guarantee all items to be as described. Feel free to email with any questions. THANK YOU. 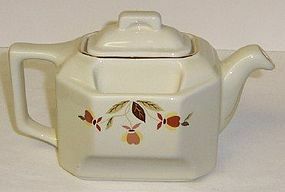 This is a really nice 2000 National Autumn Leaf Collectors Club-NALCC Autumn Leaf Jewel T Teaball Teapot and Lid. 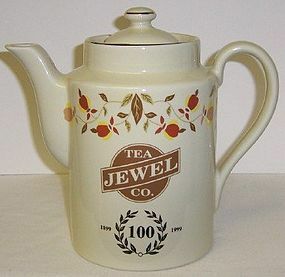 Both the Teapot and Lid are in mint, unused, condition, in the original box. It is signed on the bottom MADE EXPRESSLY FOR The AUTUMN LEAF COLLECTORS CLUB by The HALL CHINA CO. 2000. Be sure to search our other Autumn Leaf items available. We guarantee all items to be as described. Feel free to email with any questions. THANK YOU.